Can i get streaming media? Pretty please? Turns out, with the Motorola Xoom, the answer is no. Lots of devices including the Nexus one. Really? the Nexus One has the hardware but the xoom doesn’t? I like my Xoom a lot, i’ve invested good sizes bits of my $ to buying apps to make the device my go to tablet. I like the size, I like the form factor, I like the OS. But traveling with the Xoom (as I did to WWDC this year) is kind of the pits, unless I make sure to pre-load the device with downloaded content. My understanding is that it’s largely to do with the encryption/DRM capabilities of the device. OK that makes sense. What doesn’t make sense to me, as a prosumer techy with a $600 device on my desk… How did Motorola not build the Xoom with these two apps in mind? 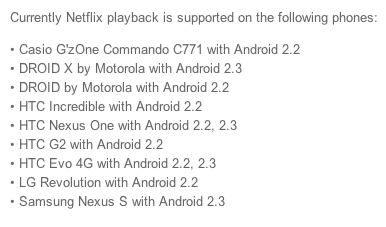 Better yet, how was Moto (for that matter, Google too) NOT working with both companies from the get go, to ensure that the Flagship tablet of the Android Army, the first device to ship with Honeycomb, wasn’t at the top of the compatible devices list? It was one thing when neither service had an app for android, it made using the Xoom, not a “This or that” decision with my iPad. But now, now two of the main use cases for my iPad (other than games and Omnifocus) are available for android… just not my android.